100 Year Old Weblog: GEO. P. OLMSTEAD DIES AT 80 YEARS. ~ PASSES AWAY WHILE SEATED AT BREAKFAST TABLE. GEO. P. OLMSTEAD DIES AT 80 YEARS. ~ PASSES AWAY WHILE SEATED AT BREAKFAST TABLE. George P. Olmstead, an octogenarian, half of whose life was lived in Kansas City, died yesterday morning at the breakfast table in his home at 1311 Forest avenue. Until five years ago he was a member of the Cady & Olmstead jewelry firm at 1009-11 Walnut street, which still retains his name. Prior to that he was one of the leading lumbermen of the Missouri valley. Mr. Olmstead had seated himself at breakfast, and was glancing over the morning paper when his daughter, Mrs. Ben F. Qualtrough, was about to serve the coffee. As she came in she noticed his head was bowed, but thought little of it, as he often became drowsy when sitting. Mr. Olmstead's head fell lower and touched the paper, and Mrs. Qualtrough became alarmed. Unable to awaken him, she called her husband, but they could do nothing and he had lapsed into unconsciousness. Dr. R. T. Sloan was summoned, but when he arrived the aged man was dead. Besides his wife he leaves a son and a daughter, C. B. Olmstead and Mrs. Ben F. Qualtrough, both of 1311 Forest avenue, Miss Catherine G. Olmstead, a sister, 88 years old, has been at Wesleyan hospital for three years with a fractured limb. The funeral will be held from the hours Monday afternoon at 2 o'clock with Rev. Burris A. Jenkins, pastor of Linwood Boulevard Christian church, in charge. Temporary burial will be in the vault in Forest Hill cemetery. Mr. Olmstead was born September 17, 1829, at Little Falls, N. Y., where he grew to manhood and learned the carpenter's trade. Early he made the journey by canal, lake, river and gulf to Corpus Christi, Tex., but did not remain there long. 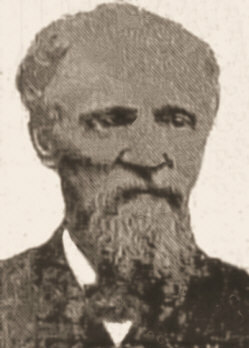 Later he engaged in the lumber business at Pontiac, Ill, where he was married in 1859 to Miss Cornelia E. Hunt, who survives him. He remained there for several years and again removed to Tuscola, where he lived until they came to Kansas City in 1869. Mr. Olmstead built a home at 800 Jefferson street and lived there until 1887, when he bought the present family home at 1311 Forest avenue. The Jefferson street house was sold at the time of the construction of the cable incline. On coming to Kansas City Mr. Olmstead became a member of the lumber firm of Leach, Hall & Olmstead, all of the members of which are now dead. Their lumber yard was west of the Union depot and the site is now occupied by a number of large wholesale houses. In 1882 he became a partner of L. S. Cady in the jewelry firm of Cady & Olmstead and in 1887 the lumber firm was dissolved. Four years ago he sold his interest in the business of Cady & Olmstead. For a number of years he was identified with R. M. Snyder, now dead, in Texas and Arizona ranch properties. Current events drew much of Mr. Olmstead's attention and he took a vivid interest in the happenings of the world at large. His large library attests that he was a wide reader and he was known as a close and intelligent student of the Bible. During the pastorate of Rev. T. P. Haley, he was an active member of the First Christian church at Eleventh and Locust streets. Mathematics and astronomy held an odd fascination for him. Mr. Olmstead was a close friend of Col. R. T. Van Horn and frequently he would contribute keen and well-written comments on public affairs to the columns of The Journal. Last fall he was invited to Pontiac to attend the fiftieth anniversary of the Masonic lodge there, which he founded, but he was obliged to decline.